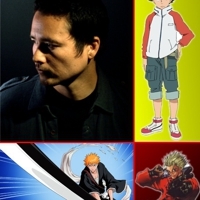 Johnny Yong Bosch, well known for a number of leading roles, got his start as Adam Park, the Black Ranger on Mighty Morphin Power Rangers. Afterwards he became very involved in voice acting for various anime titles, including his first major role in the classic Trigun as Vash the Stampede. He is also the lead singer of the band ‘Eyeshine’.